As the reveal of the new government drew nearer, New Zealand waited in front of their TV screens and computers, awaiting for the final word. After seeing many signs and advertisements, I can say that the support from the people is incredible. Seeing kids and adults alike, coming together and holding signs at the side of the road, showcasing who and what they believed in was pretty awesome. Just by looking at the vote count, National is the team bypassing everyone else. 48% of the votes were National while Labour lagged behind with only 24%. It seems that National's Mr John Key will be receiving his third term in the office as the Prime Minister. Now that the elections are over, one of National's things on their to do list is bringing a simple economical plan to the table for the next three years. Their main goal is to Live within our Means, Start Paying off Dept and Keep Generating New Jobs. Since 12 months ago, they've grown eighty three thousand new jobs and by the time its 2018, there should be 150,000 new jobs. More on the subject about new jobs, National plans to lift the quality of teaching to provide a better education. Not only that but now they are providing free doctors visits for children under 13. New Zealand has voted and hopefully this is the best choice for our country. Although I am not a very big politics person, I actually can't wait to see what happens next time Elections come along. Maybe they'll get more creative with their advertisements, who knows. But for now, congratulations to National. After a week of filming and ubiquity, we finally completed our movie. We worked really well together, only arguing about a few things once or twice. But now we have to ask ourselves; How well did we manage? Personally, I think my group did exceptionally well on managing our time and working independently. We stuck criteria and made a great MTV in the time frame we were given. I helped out more specifically with the filming, editing and planning. Lots of the scenarios and ideas in our movie was created by me. I appeared the least amount of times in the movie since I worked particularly behind the scenes. When it comes down to managing myself, I think I did a pretty good job, especially as apart of the group. I was there to kick my friends when we went off task so we were able to finish on time and move onto the next thing on our list. Editing was probably the task that I managed myself the most with, I focused solely on finishing the movie so we worked more quickly than we thought we would and got a lot done. If my group had to do something better, I think it would be all doing something at once. Some of our group members started to mess around when they were not needed. It would had been better if we got each other to work on something else while we worked on the movie. Other than that, I think we did pretty good on our movie and managing ourselves. We got a 17 out of 20 on our rubric which is pretty impressive. Click the photo to see the specific details. 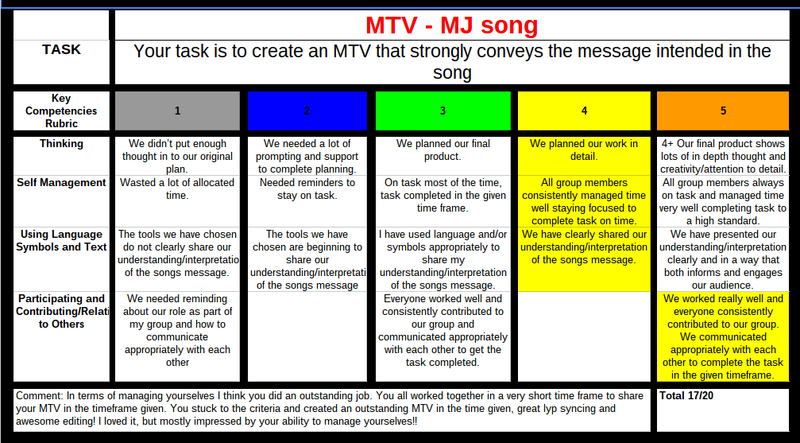 Self Management was a topic that our class was examining, so to practice this key competence, we were given the task to create a Music Video using one of Michael Jackson's songs. We had to work in our year groups so the Year 8 Girls had to work together and same with the rest of the class. Our teacher will be judging our movie and marking it based on how we managed ourselves and the quality of our movie. We worked pretty hard to complete this movie and put quite a lot of effort into it. Hope you enjoy! Key Competencies are a part of the New Zealand curriculum to help young people, like ourselves become supportive, confident and actively involved lifelong learners. Self Management, being one of the Key Competencies, is the aspect that we are currently exploring. People who are effective self managers are reliable and are able to set high standards. Being able to manage yourself during class is actually pretty difficult to do. It is really easy to get distracted by friends and surroundings when trying to complete work and tasks. Plus it’s as simple as that to go onto another site and play games. During class, self management looks like working independently and working away from interruptions. Also knowing when to tell someone to do their work and when to take a break and talk. The Street is an area in our intermediate block that is another working space for us. Its reasonably large so there is lots of room for all our classes to use. When in the street, we have to fight the temptation of speaking to our other friends in different classes. It’s not a very quiet area so distractions are inevitable. Outside of class, like at the playground, kids find it much harder to manage themselves. Although lunch and morning tea is a time for us to play and take a break, it is a great idea to always think ahead and reflect. Obeying the rules and thinking about others around you is how the kids should manage themselves when playing and messing around. In conclusion, self managers are innovative and cable learners. With can-do attitudes, they can make plans and strategies for meeting challenges. They can also set goals for themselves to strive and achieve. Whether they are leading or following, they are resourceful learners. The Storylines Festival turned out to be pretty successful. I definitely enjoyed the show and the authors who presented. However I liked last year better, the audience was more involved and the authors were connecting with us. Not that this year was terrible, it was really educational. Juliette McIver and Jill McGregor were probably my favourite authors during the festival. Juliette was incredibly funny with her bubbly personality and her books and stories were really out there. She liked to rhyme a lot and she even created her own words to match her story, much like Margaret Mahi who she looked up to. She read aloud one of her many books, Queen Alice’s Palaces. The graphics stood out to me a lot. The illustrator had used iconic buildings to incorporate Queen Alice’s many Palaces and that made the book even more interesting. If I were to present at the festival, I would really interact with the audience. Paula Green had gathered some students to create a poem on the spot. They each had a line they would say directly after the person before them. I thought that was a great way to get involved with the kids and teachers. Another way I would do to get the kids intrigued is get some kids up to act out the story as I read it. That would be pretty funny since they are just improvising. I would’ve loved to have seen the authors collaborate to create a wonderful masterpiece. That would’ve been amazing. I would like to give a great big thank you to the authors and to the Storylines Festival holders because it’s such a great experience for kids everywhere. Their stories and backgrounds gave us a look at what an author really endures to make their stories the best it can be. Cath Mayo traveled to Greece where she got lots of information for her books. That’s just plain awesome.